Santiago Calatrava has a cultural vision that unifies art, science and technology. This book presents Calatrava's work in the context of contemporary architecture and society for the first time. His technical projects are shown to spark off abstract sculptural essays, which in turn serve as a research laboratory for innovative engineering. The author traces Calatrava's influences and then focuses on 25 projects, including photographs, drawings and sketches. This book presents Calatrava's work in the context of contemporary architecture and society for the first time. His technical projects are shown to spark off abstract sculptural essays, which in turn serve as a research laboratory for innovative engineering. 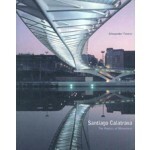 The author traces Calatrava's influences and then focuses on 25 projects, including photographs, drawings and sketches.